RIO DE JANEIRO – Rio de Janeiro, was the stage for the 49th edition of the Global Women in Management (GWIM) Program. 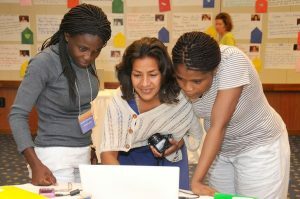 For four weeks, 27 mid-career women of different parts of the developing world, NGO representatives and ExxonMobil executives worked together to try and create positive and sustainable change at all levels of society, may those be personal, organizational, within communities as well as nationally. Women at work at the 49th GWIM, photo by ExxonMobil. The workshop is based on a partnership with CEDPA (Center for Development and Population Activities) and its main objective is to create a supportive and participatory learning environment for the exchange of best practices and experiences, strategy development and skill building for the women to put into practice when they return to their countries of origin. “ExxonMobil strongly believes that women empowerment has a great social effect” said Public Affairs Manager, Maria Luiza Soares during an interview with The Rio Times. “Woman take care of the elder and the youngsters and are great at training people too, that’s why ExxonMobil invests mostly in the GWIM among its corporate social responsibility programs” she also added. “Our workshops are mainly oriented towards African countries, but I believe there are quite a few things to improve in Brazil too, specially in the Northeastern part of the country, where the female condition is still below expected social levels”, said Mrs. Soares. From July 27 to August 21, 2009, seven women from Angola, one from Argentina, five from Brazil, one from Colombia, one from Ecuador, one from El Salvador, six from Equatorial Guinea, one from Guatemala, three from Mexico and one from Panama were given the tools to higher levels of management accountability and pragmatic results. Programs such as financing, leadership, fund raising techniques, strategic communication, proposal development and politic activities transpired. The 27 women were selected by taking into account their competences and abilities acquired by working on community and faith-based organizations. Exxon Mobil Corporation, better known as ExxonMobil, is a oil multinational company from the United States of America. It is the result of a merger between Exxon and Mobil in November 30, 1999. Both Exxon and Mobil were descendants of the John D. Rockefeller corporation, Standard Oil which was established in 1870. Nowadays ExxonMobil is the second largest company for revenue and the first in terms of market value. The corporation operative brands are: Exxon, Mobil and Esso. 27 mid-career women of different parts of the developing world, photo by ExxonMobil. The US oil giant’s assets count on 38 refineries in 21 countries around the globe. ExxonMobil is the largest non-government owned company in the energy industry and produces about 3 percent of the world’s oil and about 2 percent of the world’s energy. In 2008, despite the barrel price drastic drop, ExxonMobil’s revenue reached US$442,850 billion: the largest in the U.S. The Brazilian headquarters are in Rio de Janeiro, however in 2003 the company opened a support station in Curitiba to manage IT and auditing operations in the country and around the world and a chemical development plant in Campinas, São Paulo. Founded in 1975, the Center for Development and Population Activities (CEDPA) is an internationally recognized non-profit organization that improves the lives of women and girls in developing countries. CEDPA’s main objective is to work hand-in-hand with women leaders, local partners, and national and international organizations to give women the tools they need to improve their lives, families and communities. 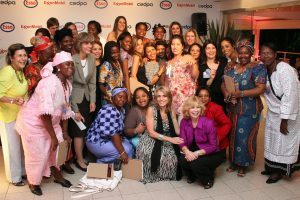 The partnership between ExxonMobil and CEDPA has already enabled the empowerment of over 250 women in 50 countries. Since 2005, ExxonMobil has invested in excess of US$4 million in this program.